We have a lot of cookbooks in our house. I don’t think I’m alone when I say that despite having a lot of cookbooks, I don’t cook with them often. Instead they are more like resource books, pages of near endless inspiration. I have read all of them, many of them much more than once, cover to cover, absorbing their insight and learning, wondering, questioning and memorizing. It shouldn’t be surprising then, that some of my most beloved books have incredible photos. As much as I love vintage cookbooks, they do lack the visual stimuli of contemporary books with their full colour, often full page, photos oozing with sharp realism and also, somehow, blurred fantasy. One of our newest cookbook acquisitions is Seasons by Donna Hay which takes the reader/cook/food lover through a full four seasons of gorgeous, simple, foods, each appropriate to its time of year, each considered carefully and executed with artistic precision. It was while perusing the Spring section that Rob paused at a layered, cake-like concoction whose layers weren’t cake at all, but meringue. 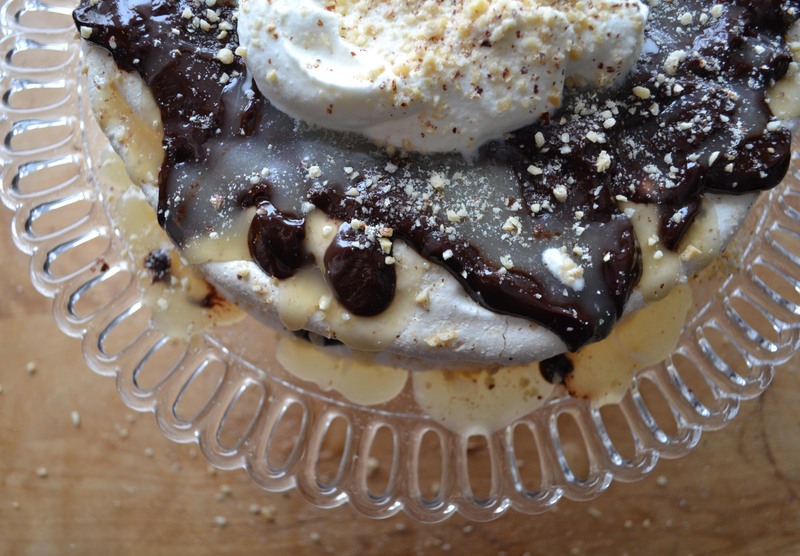 I had been brainstorming desserts to have with our all appetizer dinner as we watch the Oscars tonight and when he pointed out the beautifully layered Pavlova, I knew we had found a winner, or at least the inspiration for a winner. (I changed up the flavours and created my own luxurious combination here of a pale cream caramel, dark chocolate and toasted hazel nut.) Although Seasons identifies a similar Pavlova as Spring fare and we are still suspended in the clutches of winter, with unprecedented snow in February, this dessert is appropriately snowy and decadent enough to enjoy while watching Hollywood’s royalty and sipping a bottle of bubbly. I predict a sweeping win in the category of ‘Best Dessert’. This recipe is constructed of many parts. 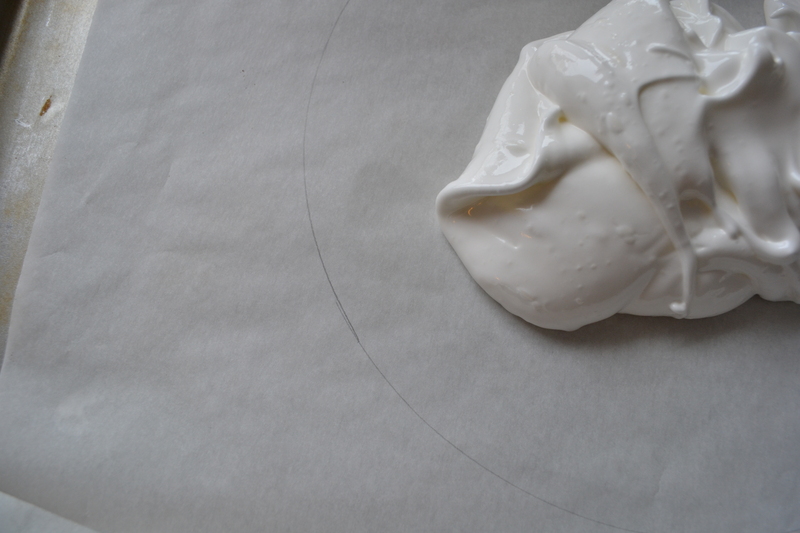 The meringue takes a while (a couple hours) to dry and crisp, so although this is not a tricky or difficult recipe, it does require some time and focus to have all the parts come together. 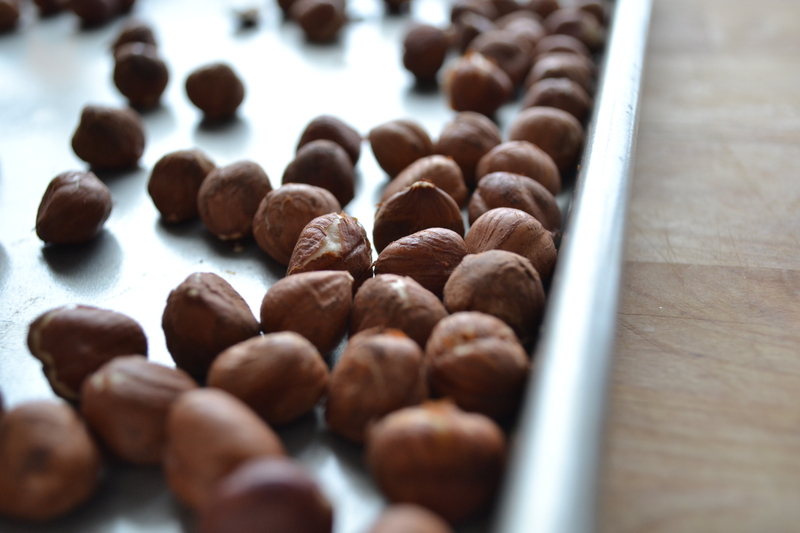 Begin with about 2 cups of raw hazelnuts. Toast them by spreading them out on a dry sheet pan and warming them at 375 degrees for about 10 minutes. They are ready when the become fragrant. While they are still hot from the oven pour them out onto a clean tea towel. Bunch the tea towel up around them into a bundle and rub them with your hands through the cloth. This causes the nuts to roll around and rub against one another and the cloth and enables you to get most, if not all, of the skins to come off. Keep rolling and rubbing until no more skins come off. Carefully remove the nuts and discard the skins. 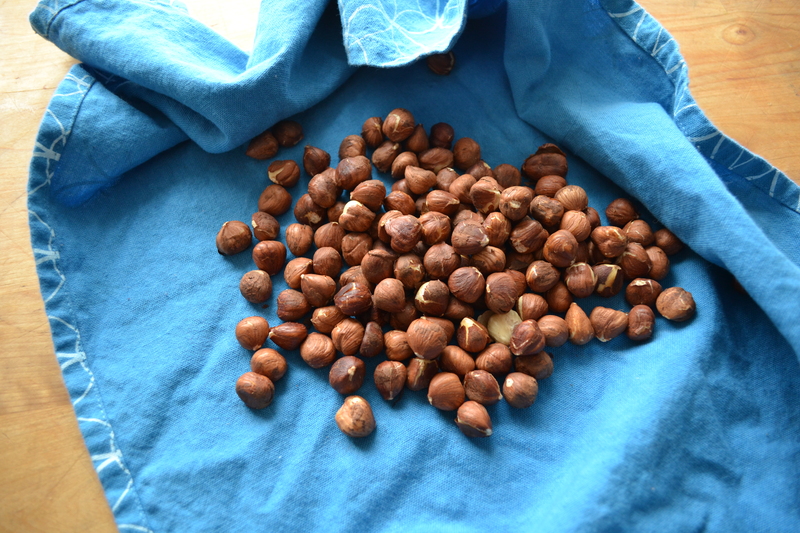 Once the nuts have cooled a quick blitz in the food processor will give you ground hazelnuts. Don’t grind them into flour, leave them somewhat coarse. Begin by preheating the oven to 200 degrees. The intent is not to bake the meringue as much as it is to dry it, hence the low oven. Beat the egg whites in your mixer until they have stiff peaks. Slowly add the sugar until the meringue is softand glossy (it won’t be as stiff once the sugar is added). Working quickly, immediately blob 1/2 the meringue onto the first sheet pan. 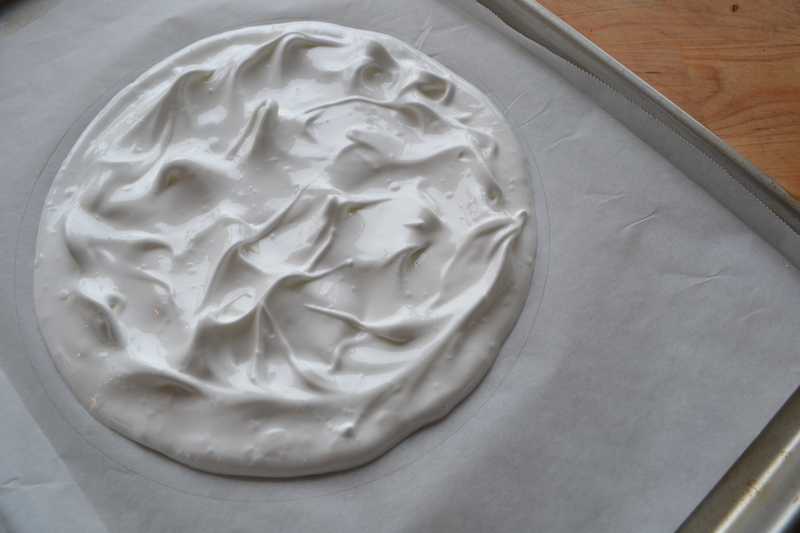 Spread the meringue to fill the circle. 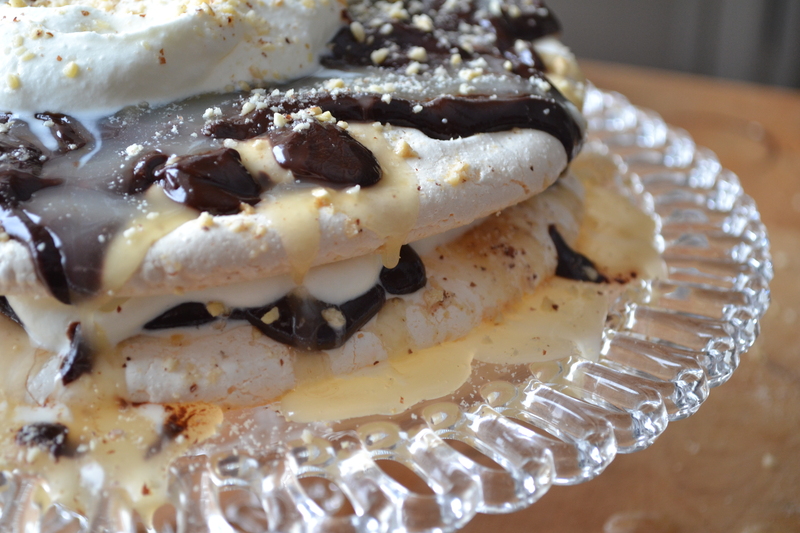 Leaving some jagged points and texture in the meringue is ideal. Repeat with the second pan and the remaining meringue. 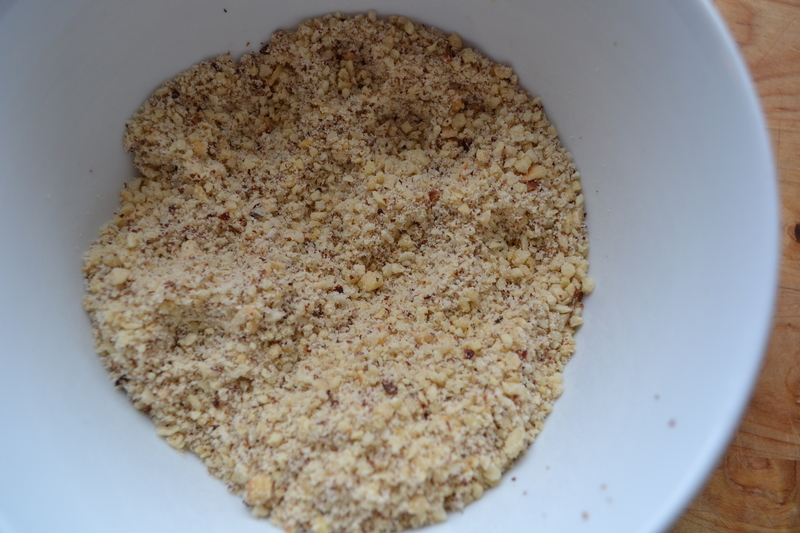 Sprinkle both disks with some of the ground hazelnuts. Place in the low oven for 2 hours or until crisp and dry. if you are not building the Pavlova immediately, just leave the meringues in the dry oven to rest until it’s assembly time. The cold cream will make the caramel seize, but constant stirring and returning it to the heat will solve that. Stir again, over medium heat until the caramel is smooth. Remove from the heat and allow it to cool and thicken. Whip 1 cup of cream until soft peaks form. Remove the dried and cooled meringue discs from their parchment lined sheets. Secure the first disk to your serving plate with a dab of chocolate. Repeat with the second disc, etc. Serving won’t be as precise as cutting, say, a cake, but be brave and just bust into the crisp/chewy layers of meringue and drizzle it with a bit more of the caramel if you like. Remember: this is a very free form dessert and it’s beauty is in it’s unique ‘imperfection’. It also tastes amazing. Enjoy!